Confession time: I totally love Roman Polanski. I don’t mean that I love the man — I don’t know him and there are certain issues that I’m not exactly sympathetic towards. What I mean is that I love the director, the public artist. As far as I’m concerned, there are three great living directors: Polanski, Scorsese and Herzog. Everyone else is secondary. I also happen to greatly enjoy Polanski’s screen persona in the few films he actually appeared in, like Innocent Sorcerers, Chinatown, The Tenant and the subject of this article, The Fearless Vampire Killers. I often wish that he’d actually gone ahead and cast himself as the lead in Knife in the Water, just to have the pleasure of watching him act. Right, so that’s out of the way. Now, onto what is perhaps my favorite Polanski film (although not, in my estimation, his ‘best’ work): The Fearless Vampire Killers, or: Pardon Me But Your Teeth are in My Neck. As the title suggests, this is one of the few unabashed comedies that Polanski has made. All of his films have some element of absurd or grotesque humor — even the incredibly disturbing and nihilistic Macbeth. But Vampire Killers is pretty much a horror-comedy. 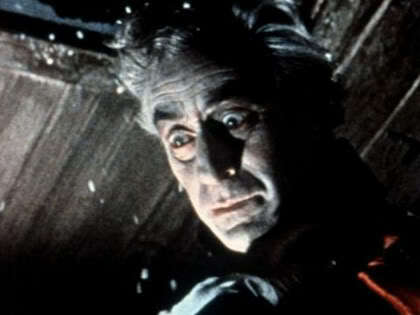 The plot comes right out of a Hammer film: Professor Ambronsius (Jack MacGowran) and his assistant Alfred (Polanski) arrive in a small Eastern European village in search of vampires. They find, naturally enough, buxom barmaids, wiley innkeepers, and well-dressed gents with long sharp teeth. The film floats along with a series of comic mishaps. Professor Ambronsius is the most useless vampire killer imaginable; he’s far more interested in proving the existence of vampires than he is in actually killing them. 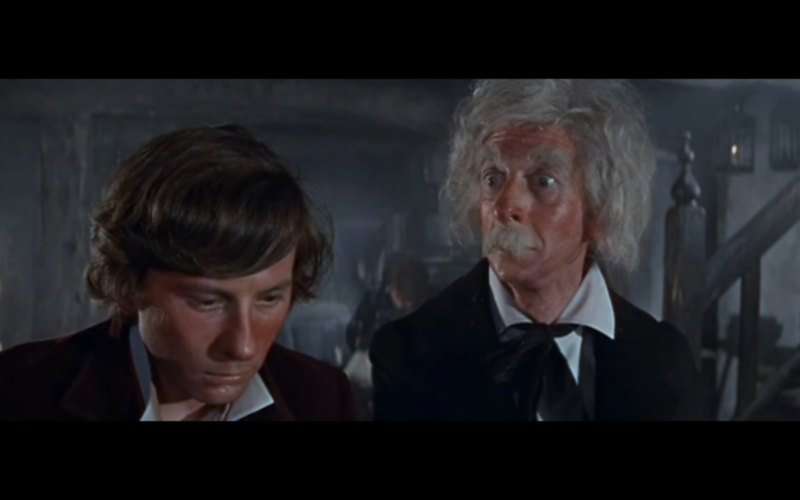 MacGowran gives Ambronsius a wild look, the very picture of an out-to-lunch academic and a far cry from Peter Cushing’s elegant and rational Van Helsing of Hammer Studios. Alfred, while far more gallant, is quite obviously a coward. The one opportunity he has to defeat the vampires he blows because he’s incapable of actually driving a stake through anyone’s chest. The Count looks a bit the worse for wear. But Polanski, never one to be outdone in his social critique, also teases out the ancient notion of Jews as vampires. The innkeeper Shagal is transformed after the abduction of his daughter Sarah (Sharon Tate, more on her in a minute) by the Count. And he’s a ridiculous caricature; a vampire who, because he’s a Jew, is not permitted to sleep in the same crypt as the Count and his son; who is not repelled by a crucifix because, as he says, ‘Oy, have you got the wrong vampire!’ The whole subplot involving Shagal is a beautiful send-up of European notions of vampirism: Jews having been accused, in medieval times, of drinking the blood of infants; the use of Jewish caricature in films like Nosferatu and Tod Browning’s Dracula. That the victims of the vampires are primarily Jews and the vampires are all characterized as decaying Old World Teutons makes plain the project underlying this otherwise innocent, comic film: Polanski sends up, with characteristic viciousness, the very basis of the vampire genre. What is adorable about The Fearless Vampire Killers is how marvelously innocent it is. And, oddly enough, that innocence comes straight from Roman Polanski himself. As Alfred, he’s a small, boyish figure, dressed in short pants and a cap that accentuates his youth. While Tate doesn’t have a great deal to do, her few scenes, imbued with a playful innocence, give the film an extra dimension. The scenes between Alfred and Sarah have a sexual charge, but there is a sweetness to their relationship, making it the kindest, gentlest romantic relationship in any Polanski film. It’s difficult to watch Vampire Killers without recalling that this the film that the couple met and began dating on. Anyone aware of Tate’s life and death cannot help but feel a level of sadness watching her on screen, and the two of them together. abducted by the Count. Alfred and Ambronsius go to great lengths to save her. 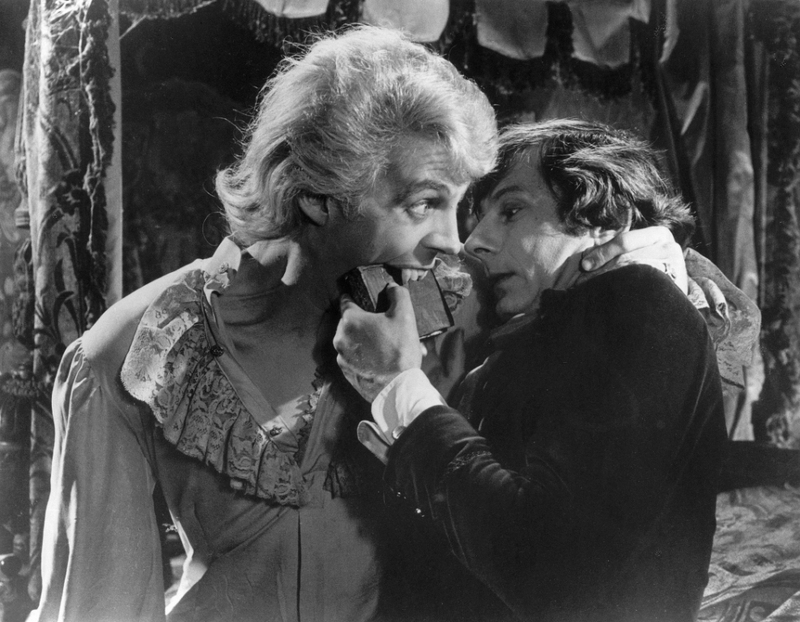 Arriving at the castle, they become acquainted with Count von Krolock and his son Herbert (Iain Quarrier). In a sharp twist on the usual, Hammer-style vampire/damsel relationship, but quite in keeping with the shifting sexuality of vampires, Herbert is overtly gay … and thinks Alfred is pretty cute. The scene between them recalls films like The Brides of Dracula (Quarrier is a dead ringer for David Peel in that film), only Polanski (not for the last time in his own features) is placed in the position of the damsel in distress. It’s a weird, uncomfortable, funny scene. I’ve called this my favorite Polanski film and it is. But it is far from his best. It drags quite a bit in the middle, dwelling on the meanderings of Alfred and Ambronsius through the castle as they search for Sarah. Certainly the most fun are the beginning scenes in the inn, the final scenes during the dance of the vampires (the original title of the film), and the haphazard, slapstick escape. Alfie Bass should get some serious credit for the characterization of Shagal, a role that could easily have become offensive. Polanski also removes much of the attractive sexuality of the vampires that is so typical in vampire movies. They are represented as decaying, decadent creatures, literally falling apart. They are, after all, the undead, and it certainly shows. In some ways (and this is odd), The Fearless Vampire Killers is Polanski’s most hopeful, most playful film. While not shying away from some very trenchant commentary, it mostly delights in its own comedy. The tenderness of the love story, even with the tinge of sadness attached to it, from a director not exactly known for warm and fuzzy films, is something of a revelation. Which is not to say that this is not a Polanski film. It is. When watching it, there’s no possible way to forget that.